Don't you love when toys start to take on a life of their own? Somewhere around the 2 year old mark, toys start to come alive. Suddenly, they have personalities. They need to be fed and carried around and they have tea parties and get their soft cotton teeth brushed. Lately I've been finding all sorts of adventurous toys around the house, and I can't help but feel like I'm caught in an episode of Toy Story 4. 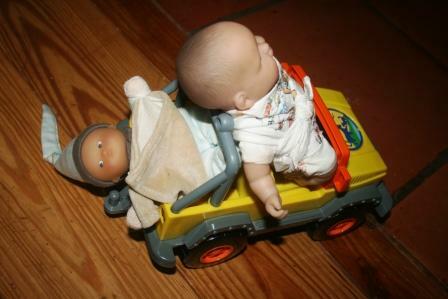 Case in point - the other day headed into the kitchen I discovered that Cort's babies had taken Diego's Jeep out for a ride. I can't help but wonder what will happen when Diego discovers his precious Jeep has been carjacked by a couple of renegade babies. And suddenly, Reid has an entourage. An entourage in the double digits I might add. And there is much drama in the transportation of said entourage from one side of the house to the next. When you're under 3 feet tall it isn't so easy to tote around a frog, a hedgehog, a jaguar, a blanket, a baby, a mouse, a dog, a sheep, and several others that are not pictured. Pretend play is so much fun. At least I think it's all pretend. Thank you for making me laugh this morning. Our VCR has stopped working. I think something is living in there. Hahaha! So cute and funny! Wow, I am tired just thinking about entertaining and transporting that kind of entourage! I love this post!! How cute Reid is with all his little friends surrounding him. Enjoy all this fun while you can..... Someday they will be TEENAGERS!! Once I found a toothbrush in our VCR. Somehow it never quite worked the same after that. Ha. 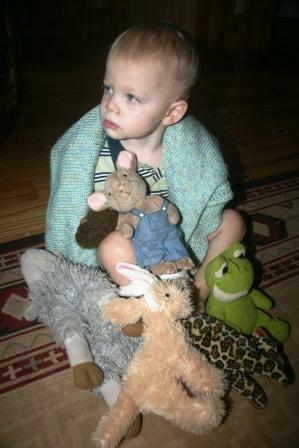 Reid is very sweet with his family of animals. My 7 year old still sleeps buried in his stuffed animals. I love it when kids "play pretend." So much better for their brain development! I sometimes look at where things get to in my house and think HOW on EARTH did THAT happen? I love it when you share the boys little antics. They are really adorable, Lisa. Reid with his entourage is so cute! Your boys sure are adorable little things! I love Reid's entourage! His mouse is especially adorable. Oh, this is just TOO cute!! I'm glad you seem to be really enjoying it. 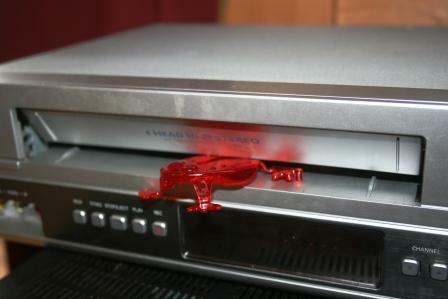 Because all to quickly you will wish for the frogs in the VCR and the unexpected toy surprises around the house again. This is the time of your life!! I had a Toy Story moment last year at WM. I seen a kid with a baby doll that looked like it moved it's head and smiled at me. It looked like one of my daughters old dolls that I thought we donated to GW. She found it under her bed this Summer! What was freaky too was that it had on the same outfit that her doll had on which it wasn't the outfit that came on the doll. It was a real baby outfit. FREAKY!!!!! I'll never get rid of Bart again! How he made it back to the house is beyond me but he did make it home! Oh this is such a cute post!! I agree your boys are adorable!! Obviously not a parent, because those renegade babies just freak me out. Adorable and relatable! Deaglan also has an entourage at bedtime which sometimes includes cars, trucks and books. Lately he's been sleeping with us and believe me there isn't room for EVERYONE on that bed even if it's a king size! Great great memories! Thanks for the great post and i hope you and the boys will love the Arretjes cake! I love it! My oldest daughter used to haul a huge load of stuffed animals all around the house and every where she went. Aw. Great memories! Cute post and photos. Our baby dolls around here end up in very interesting choices most of the time. The baby stroller just sits empty! Loved this. Even though the red-frog-burping-VCR scared me a little. It is astonishing to consider how things happen to end up in certain places at times isn't it?? What a fun post!